As a committed Denier, I got tired of all the gasses being emitted and decided to take a look at the data myself. 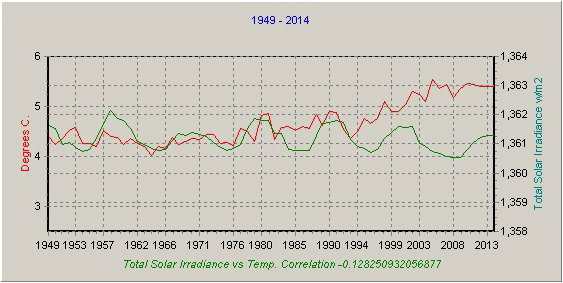 I am a programmer and a data fiddler so a program was created to look at existing temperature, CO2, sunspot and Total Solar Irradiance (TSI) data. Please feel free to criticize and point out any errors. Just remember, it is not my temperature data but NOAA's. The period of record for temperature data presented here is from 1949 to 2014 and is NOAA model data that has been reanalyzed or corrected to what actually occurred (supposedly). The data is world-wide from 90N to 90S and from 0 – 360 Longitude in 2.5 degree increments. · Global temperature data was downloaded from the NOAA site http://www.esrl.noaa.gov/psd/cgi-bin/data/composites/printpage.pl. · Sunspot data was downloaded from WDC-SILSO, Royal Observatory of Belgium, Brussels. · CO2 values were obtained from NASA but it is almost a straight line and the computer program calculated it for each year. 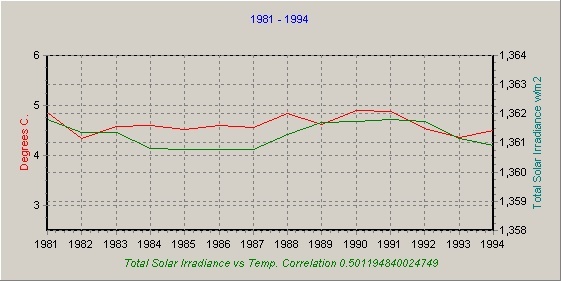 · Total Solar Irradiance data was obtained from University of Colorado at Boulder. Note! 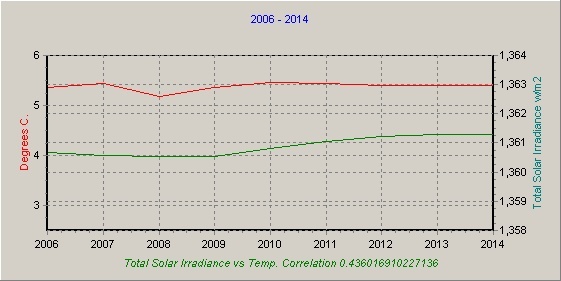 Total Solar Irradiance (TSI) data was not available for 2014 and to fill out the data set, 2013 data was used for 2014. Average yearly temperature data from a NOAA site was downloaded for the months January through December for all years 1949 – 2014. A computer program was written to extract and average the data and graph the results. Initially the program graphed Temperature, CO2, and Sunspots for the months November through March. The correlation of temperature and CO2 was not surprising, or even interesting for that matter, and the correlation of temperature and sunspots was interesting but visually left a lot to be desired. Additional data was downloaded for all months and the graphing program was changed to use Total Solar Irradiance (TSI), which improved on the Sunspot correlations. If anyone wants to see the graphs for CO2 and sunspots, let me know. Fig 2. It is interesting to look at the data from the start until it begins to diverge. 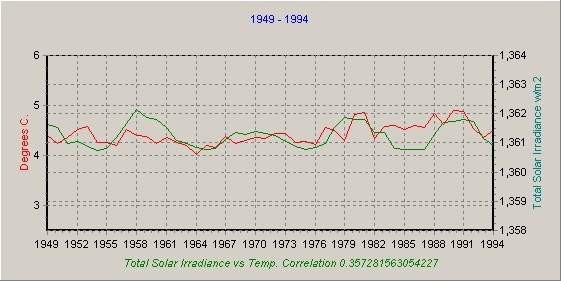 The graph here is for 1949 to 1994 and shows that the correlation between temperature and TSI for this 45 year period is 0.36. During the entire period from 1949 to 2014 the temperature increased, but there are long periods (e.g. 1949-1969) when temperature remains constant or even decreases. As can be seen in Fig 1 the correlation for Temperature and TSI is negative. However, using the entire data record in this way causes correlations for shorter periods to be masked; therefore the record was broken into periods characterized by similar temperature trends. Fig. 4 - The second period is 12 years from 1969 to 1981 when the temperature is increasing. 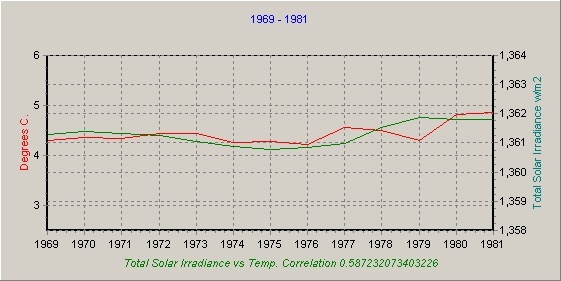 The correlation of Temperature and Total Solar Irradiance is 0.58 . Fig. 5 - This third period is 13 years of variable temperatures from 1981 to 1994. The correlation of Temperature and TSI is 0.50. Fig. 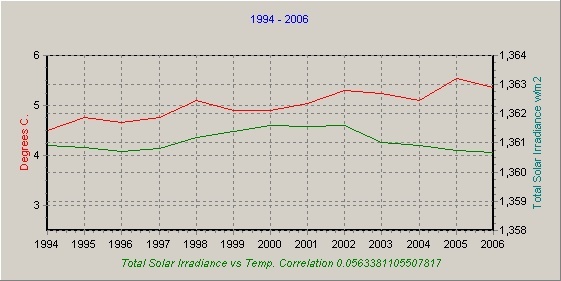 6 – The fourth period from 1994 – 2006 had increasing temperature and the correlation with TSI is 0.05. Note that the temperature and TSI curves sharply diverge in 2002, but it actually started in 1995. Fig. 7 – The last period from 2006 – 2014 shows that temperature is almost constant. The correlation of temperature and TSI is 0.43. 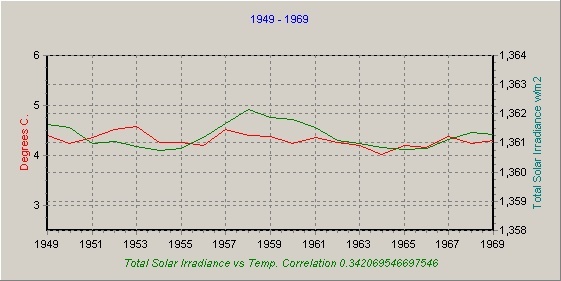 If the data is reasonably accurate, it is impossible to deny that changes in temperature are closely related to Total Solar Irradiance from 1949 to 1994. Although not shown, CO2 and Sunspots were also graphed and a positive correlation for CO2 occurs only when temperatures are rising in the periods 1969-1992 and 1994-2006. The correlation for temperature and TSI is positive for all periods, although for 1994-2006 it was a measly 0.03. Update: 500 mb temperature data for the same period as above was compared with CO2 and TSI and the results were very similar with those of surface temperatures.